1. Tell us a little bit about yourself: Bryan Arens. I’m from Oklahoma City, Oklahoma. I have been flying kites since I was 13 years old. 2. Why did you join the AKA? The friendship and to meet others who share the same passion. 3. What is your favorite kite to fly? 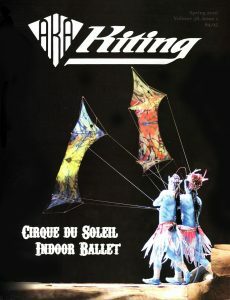 FlowForms, parafoils, and inflatable show kites. 5. If you could fly with anyone dead or alive, who would it be, and what would you fly? My mother, she is the reason I have a passion for kiting. 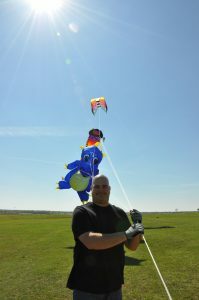 My inflatable show kites and FlowForm lifter kites. 6. What is your favorite event or kite festival? Any festival I can attend. 7. What is one thing you wish more people knew about kite flying? 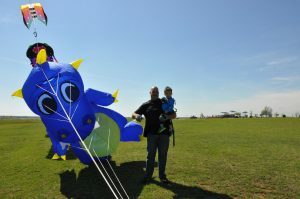 How much fun it is and all the great quality kites that are available now. 9. You’re a new addition to the crayon box. What color would you be and why? Blue since it’s my favorite color.